Gorgeous weather (except for the wind), great stages, nice people! Jon came out sixth out of a whole bunch of 21 semi-auto gunners while I squeaked out seventh sixth out of 14 pump-gunners. 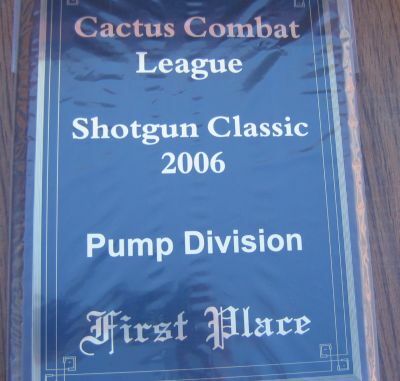 The match attracted many Tucsonans and Phoenix-area luminaries that I hadn't seen since the Superstition 3-Gun. Prizes were determined by raffle...I brought home an Uncle Mikes shotgun case that I can barely squeeze my 870 into (darned sidesaddle!). Jon got a T-shirt and cap from the big sponsor, Sportsman's Warehouse. We're all entered into a raffle for the grand prize, a Remington 870 Magnum Express. I hope I win so I can retire my beat up 870! Ya know, it's not so bad placing where I did...I'd rather be an "average" shotgunner among Arizona shooters than a basement-dwelling C-Classer as I am in USPSA competition. Enjoy the video (and don't mind the soundtrack). Maybe next year, these two Ole Pueblo Cats will join the fun! BTW, Jon crushed Stage Four as Second Best and my Stage Five performance was Third Best in Class! Great to see- I'm hoping there are more videos like this to come. And the soundtrack was great. Especially like the Lone Ranger theme! Nice shooting on the second stage....I really like the sound track as well. That's what I miss about the desert...puffs of dust from around the target! I have Remington 870 shotgun too :) what sidesaddle do you have on it?